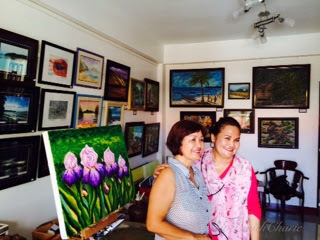 We drove to Kalibo from Roxas City to see the paintings of Erlinda Quimpo Wilson at her own Studio Q in the center of the city. At the time of our visit in February, Erlinda was busy preparing for the Transwing Art Exhibit at SM Aura Mall in FortBonifacio where her paintings were included in the exhibition. Erlinda has received awards for her works and these are proudly displayed at the studio. The walls of the cozy studio show a wide selection of her paintings depicting local scenes or festivals as well as canvasses she completed while in U.S. where she took painting classes. I really loved this peaceful painting of 2 people busily working on the field with their backs bent against violet tinged mountains in the background.